Ponting was born in 1870 in Whiltshire, son of Francis William Ponting and his wife Mary Sydenham. He entered banking at the age of eighteen, but did not enjoy it and left the profession. He moved to California where he married Mary Biddle Elliott in 1895 and ran a fruit ranch. In 1900 after the fruit ranch proved commercially unviable Ponting turned to photography to support his young family, ironically it was his photographic career which ultimately resulted in him deserting his family. After winning several photographic contests he was hired by a stereopticon company to produce views for their machines. He travelled widely in the Far East, South-East Asia and Europe and was a pioneer in the use of the camera as a medium of art rather than a mere recorder of events and persons. From 1904-05 he covered the Russo-Japanese War for Harpers Weekly. In 1910 he published his first illustrated book In Lotus Land Japan this resulted in Ponting being recognised internationally as a popular photographer and travel writer. It was images from his travels which he used to entertain expedition members on their voyage to Antarctica. He was selected for the British Antarctic Expedition, 1910 – 1913 (leader Robert Falcon Scott), as the expeditions photographer or camera artist as he preferred to be known. He hoped that his images would contribute to geographical knowledge and in the settling of the expeditions finances on their return. The technical difficulties of photography in the Antarctic were formidable but Ponting overcame these problems by his technical mastery. He built himself a small darkroom in one of the huts at Cape Evans. Here he spent 14 months, producing over 1000 photographs. He photographed the behaviour of seals and other mammals and birds, behaviour that had previously been a matter of speculation, producing many valuable scientific records. These photographs also act as a visual diary of expedition life. 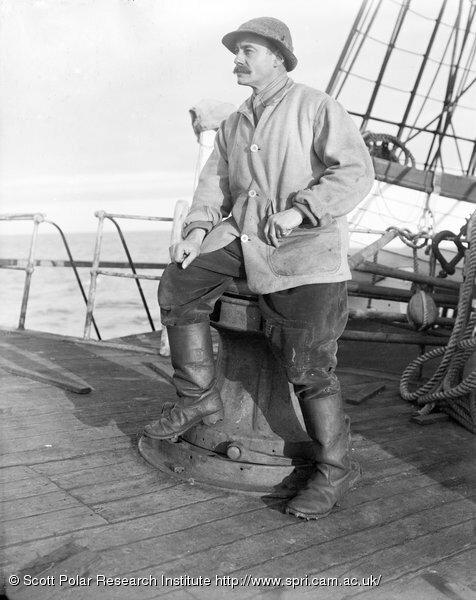 Ponting strived to get the perfect photograph and often put himself or expedition members in risky situations, for example constructing hoists to hold himself and his equipment over the edge of the ship in order to get the exact shot he desired. Many of the expedition members were asked to pose for photographs, this became know as ‘ponting’ i.e. posing for photographs in uncomfortable positions in cold weather whilst Ponting tried to get his perfect shot. During the expedition Ponting also captured moving pictures, having been on a crash course just before the expedition and acquiring a specially adapted Newman-Sinclair camera. His film of the expedition Ninety Degrees South (1933) remains a classic of polar photography, however, at the time it cost Ponting a lot of money and failed to be a commercial success. He left the Antarctic in February 1912 as it was felt he was too old to endure another Antarctic winter. After his year in Antarctica, he produced various versions of the Ninety Degrees South and undertook a number of unsuccessful business enterprises. He was internationally recognised for his work: honours included the Polar Medal, the Royal Geographical Society Medal and a medal from the Emperor of Japan. He died in 1935 in London aged 65. Ponting, Herbert G. (1975), ‘Another world: photographs in the United States, Asia, Europe and Antarctica, 1900-1912’. London: Sidgwick and Jackson. Ponting, Herbert G. (1910), ‘In lotus-land Japan’. London: Macmillan and Co.
Arnold, H.J.P. (1969), ‘Photographer of the world: the biography of Herbert Ponting’. London: Hutchinson. Savours, Ann ed. (1974), ‘Scott’s last voyage through the Antarctic Camera of Herbert Ponting’. London: Sidgwick and Jackson. This entry was posted on Friday, November 7th, 2008 at 11:23 am	and is filed under Biographies, Ponting Herbert George, Resources. You can follow any responses to this entry through the RSS 2.0 feed. Both comments and pings are currently closed.